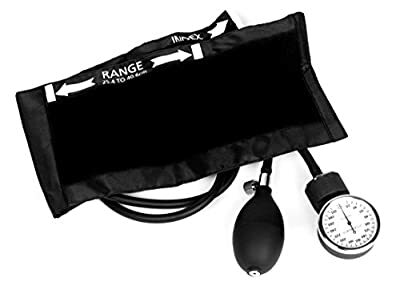 The EverDixie deluxe adult size aneroid sphygmomanometer unit offers a calibrated blue nylon cuff which measures pressure from 20mmHg to 300mm Hg. Deluxe inflation system has a two-tube, latex bladder and a large, knurled air release valve for precision deflation. Deluxe end valve reduces dust build-up.